The McKenney-Hall lithographs of Seminoles and Creeks are from portraits painted mostly in the 1820's. These early pictures show already distinctive traits in Seminole long shirts separate from Creek or Cherokee. There seem to be two general kinds: with a wide collar that opens out of the front and neck, or with an attached cape that lays over the shoulders and hangs down the front. The cape can be rounded or triangular. The round cape is essentially the same as on a "frontierman's coat." A simplified pattern for this kind of coat is called a "caped southern Indian coat" in Hanson & Wilson, 1976, and a more detailed pattern is available from Missouri River Patterns as "The Rifleman's Hunting Frock" (Reddick, 1983). There are many examples of Seminoles of the 1820's and 1830's wearing a rounded cape ("Chitee Yoholo" SILP #175), and it stayed very popular with Creeks ("McIntosh" SILP #144, and "Ocho-Finceco" SILP #153). "Micanopy" (SILP #172) is wearing a rounded cape that could be on its way to being the cornered triangular cape. In five of the ten McKenney-Hall Seminole portraits, and in none of the ten Creek portraits, the sides of the cape have moved up off of the upper arms to the outer edge of the shoulders. The front corners, which still lay over the collarbones, have necessarily become less squared and more acute. In all five examples, the pointed cape has edge ruffles. Is this the pointed cape that became the triangular Seminole standard? Unfortunately, we don't know what's happening with the cape on the back of those coats. At what stage did the back stop being rounded and acquire a pointed corner in the center? Since it didn't occur to any prominent Seminole to turn his back to the artist for his portrait, do we have to accept a full leap from a rounded to a three-cornered triangular cape? In Sturtevant, 1962, we can see the backs of five long shirts roughly sketched in "A Newly Discovered 1838 Drawing of a Seminole Dance." All but one clearly have a rounded cape. The fifth might be pointed only by stretching the point on a sparse sketch. Fortunately, there are four examples to provide clues for an early caped longshirt. And, they are all collared, not round caped long shirts. The long shirts with wide collars were apparently used through the Second Seminole War, to judge from Catlin's paintings. Not one of his seven portraits of adult Seminole males clearly show a cape of any kind, while a couple do show wide ruffled collars ("Mick-E-No-Pa" SILP#203, "Ee-Mat-La" SILP#209). Three of the twelve McKenney-Hall portraits show what could be a collared long shirt. A long shirt with a wide ruffled collar would be very appropriate for a Second Seminole War Re-enactor. And, it's possible to wonder how many of the collared longshirts painted by Catlin had a triangular cape in back. The Florida Museum of Natural History in Gainesville has a cotton long shirt given to William Golding in the late 1830's. This shirt remained in his family in upper New York state for many years, and wound up in a Canadian museum, from which it was traded to Florida. Its plain front, which could appear to be the simplest kind of collar, gives no clue to the dramatic triangular cape in back. The cape is attached along the whole width of its upper edge; the outer corners are not loose, so that the narrow ruffle that comes up the front is able to continue unbroken to the cape's edges. The ruffle is attached to the cape with a single straight applique strip and shows on both sides of the strip. Its triangle is a deep isosceles, not the right-angled triangle that was the later standard. Detailed measurements are not yet available, but it would appear that this cape could hang as low as the small of the back. The second example is a buckskin coat in the Museum of the American Indian, Heye Foundation, Spec. #22/9750. It is "said to have been worn by Osceola at the Treaty meeting." While that interesting sidelight comes with no hard documentation, we could probably assume that the cut of the buckskin might be similar to the cut of early cloth coats. The front of the coat opens up to a collar not much different from our own modern coats. But, a look on the back shows that this collar is really a wide triangle with points resting on both shoulders. The cape doesn't hang lower than the shoulderblades. Sturtevant, 1956, illustrates two longshirts collected before 1895, very similar in several detaiis to the Gainesville example. Coat 1 has additional ruffles on the shoulders, like the Gainesville coat. Coat 2 has cross-diagonal applique strips, same as the Gainesville coat. But on these two coats, the cape's top outer corners are free, and the cape is attached to the longshirt only in the middle of its short side to the neck, as in these instructions. On both, the narrow ruffle up the front does not go continuously past the neck to connect with the cape's ruffle, even though the front and cape ruffle is the same material on one example. There are two separated straight applique strips on the capes of both coats, and Coat #2 has additional cries-cross applique. These capes appear to reach as wide as the shoulders only if the ruffles are included. A fifth example of an old-style longshirt is Spec. #13/5085, Museum of the American Indian, Heye Foundation. Its triangular cape is cut the same as the illustrations in Sturtevant, 1956, with a wider ruffle, and four narrow adjacent applique strips. The cape reaches full shoulder width only by including the ruffles. The cape's print is different from, but complementary to, the print used for the longshirt's body, which apparently was not unusual. The bottom of this coat is very sparsely decorated, but the back has a tail slit with applique and ruffle edging that is a simple version of all later examples. Many examples from the 1890's and later are available for inspection. The Florida Museum of Natural History has a longshirt collected 1892-94 by the Ingraham family from "Tiger Tail Town." 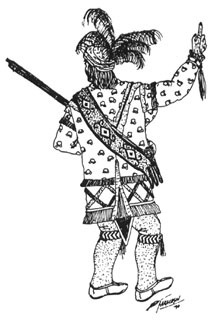 Fifty years after the Second Seminole War, the triangular cape has the same shape, but has become somewhat larger, so that its upper points extend to the tops of the shoulders and the ruffles lay over the tops of the arms. The cape's print is the same as the body. Its wide ruffle is consistent with others from this period, and it has three adjacent straight applique strips. A specimen collected in the 1890's displayed by the Historical Association of Martin Company, Stuart, also has a large cape that's shoulder width with ruffles at least three inches wide extending past that, with three 1/2" wide straight applique strips inside them. Interestingly, the cape on this one is not the same print as the body of the longshirt, although its color is the same. The Historical Association has another longshirt on display whose cape material is also a different print but of the same color as the body material. That longshirt's cape has four 1/2" wide straight applique strips inside the very wide ruffle. Apparently, to control the flopping about of the cape, some makers started tacking down those outer corners to the tops of the shoulders. The Museum of Natural History, New York, has several longshirts collected by Skinner in 1910 on the Big Cypress Reservation (Spec.#'s 50.1-2251; 50.1-2252; 50.1-2253). Two of these have a solid black body and cape base. The third uses a slightly different red print for the cape than the for the body, but the difference is so slight that it isn't noticeable at first glance. Examination shows that every single one of them has the cape attached both at the neck and the outer shoulders, but always with a token gap left in between, and that token gap still exists in an example collected by the Museum in 1962 (Spec.# 50.2-6370). An example in a private collection collected in 1985 at the Tampa reservation has the cape attached to the shoulders along its whole length from corner to corner, coming full circle in 150 years. Instructions for a triangular caped long shirt have been developed here for the hobbyist instead of a round cape because of its common use long after round cape was discontinued. We don't see the rounded cape among Seminoles after the 1850's, while the triangular cape was used, with stylistic differences, well past the turn of the century. Those differences are in the size of the cape relative to the longshirt, the width of the ruffle, and the width and number of applique strips running just inside the ruffle. A very few fine examples after the 1890's have more complex applique patterns, as well, and may have patchwork strips after the 1920's. An easy, but less common way to gather cloth was to sew a large running stitch along the edge, gather along the thread and sew that down. With practice, you ought to be able to sew pleats as you go along without first gathering them with a loose running stitch. Several small pleats are preferable to a few large ones. Besides using pleats for ruffles and where the two fronts are attached to the top, you also use them where the sleeve closes into the cuffs, and where the top of the sleeves join the body. *Red straight applique may have not been used because these longshirts used red for a base color. We see the same colors used over and over, regardless of time or location. This may not be coincidence, because these colors have special significance for the Seminole. "One of the most interesting facets of Seminole mythology is 'The Wheel of Life.' The wheel is made up of five colored circles with a cross in the center. The inner circle and cross are red, followed in order from the center outward by blue, black, yellow, and white." (Peithmann, 1957). 1958 SOUTHEASTERN INDIANS LIFE PORTRAITS. Scarecrow Reprint Corporation, Metuchen, NJ. 1969. 1982 THE BILLY BOWLEGS WAR, The Mickler House Publishers, Chuluota. 1955 "Osceola: Portraits, Features, and Dress," The Florida Historical Quarterly, XXXIII: 3 & 4, Gainesville. Hanson, James A & Wilson, Kathryn J. 1976 THE MOUNTAIN MAN'S SKETCH BOOK, VOLUME TWO. The Fur Press, Box 604, Chadron, NE 69337. 1967 HISTORY OF THE SECOND SEMINOLE WAR, 1835-1842. University Presses of Florida, Gainesville. 1914 Portrait Gallery of American Indians. Ed. James D. Horan. Crown Publishers, 1986. 1990 How to Make Beaded Pouches and Bandoliers of the 19th Century Seminole. Self published, Orlando. 1977 THE FORGOTTEN FRONTIER/ Florida Through the Lens of Ralph Middleton Monroe. Banyan Books, Miami. 1957 THE UNCONQUERED SEMINOLE INDIANS. Great Outdoors Association, St. Petersburg. 1983 "The Riflemans Hunting Frock," #4799-500-005. Missouri River Patterns, Box 314, Denison, TX, 75020. 1913 "Notes on the Florida Seminole." American Anthropologist, Vol.15, #1:63-77. Reprinted in "The Seminole Source Book," ed. William C. Sturtevant, 1987. 1956 "Osceola's Coats?" Florida Historical Quarterly 34:315-28. 1967 "Seminole Mens Clothing" in "Essays on the Verbal and Visual Arts; Proceeds of the 1966 Annual Spring Meeting of the American Ethnological Society," ed. June Helm pp. 10-74. Seattle: American Ethnological Society; Distributed by the University of Washington Press. Reprinted in "The Seminole Source Book," ed. William C. Sturtevant, 1987.